Eleaf iJust 2 Mini Tank 2ml with a 0.3ohm EC coil Head is best for Eleaf iJust 2 Mini Starter Kit 1100mAh. 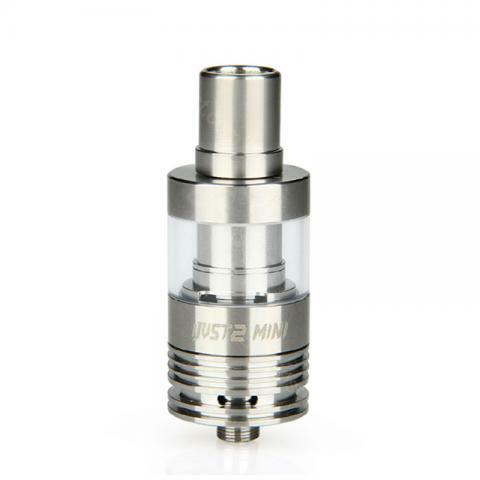 Eleaf iJust 2 Mini Tank has 2ml capacity. Best for Eleaf iJust 2 Mini Starter Kit. iJust 2 Mini Tank with a 0.3ohm EC coil head has bottom airflow system, making the cooling capacity has been greatly improved. It is your best choice. • EC head is adopted in iJust 2 mini atomizer, which is consisted of two heating coils vertically placed in parallel. It enables a large amount of cloud production. • The large capacity of atomizer tube reaches 2ml, which is more convenient and user-friendly. • The special structure design for the iJust 2 mini atomizer standard base improves the heat dissipation capacity to a large extend. • The amount of airflow can be adjusted by rotating the airflow control ring on iJust 2 mini atomizer standard base so as to get different vaping experiences. How to fill e-juice: First unscrew iJust 2 mini atomizer base off the atomizer. Then slowly refill e-liquid into the hole along the tube. At last, screw iJust 2 atomizer base onto the atomizer. • It doesn't come with liquid, you shall buy separately. • You can buy replacement coils: 0.3ohm and 0.5ohm EC Heads, EC Ni Head, EC Ti Head, ECR Head. Hatte schön mehrere Dampfer von teuer bis günstig und Eleaf ist echt empfehlenswert. Eleaf iJust 2 Mini Tank is beautiful and generous, small and portable, and can be placed in small place such as pocket.